I always loved writing. But I first knew I wanted to be a journalist when I was 16. It was my second time, but first real memory, of visiting Washington D.C. The leadership program I was with brought us to a number of museums (Smithsonian and the like) over the course of two weeks. The one that I will never forget: The Newseum. I remember approaching the giant rectangular building, blocks away from the iconic Capitol building. The front entrance, lined with glass cases displaying that morning’s front page of news from each of the 50 states. I studied those front pages until I was nearly dragged inside by my groups’ supervisors. Little did I know, those 50 front pages were only the beginning. I can only remember my time spent in The Newseum as awe-inspiring. I got lost in the Pulitzer Prize photojournalism exhibit. And the 9/11 exhibit displaying front page breaking news from around the world. And the story and simulation of the fall of the Berlin Wall. And the delicate archives dating back to the conception of newspapers in the 1800s. 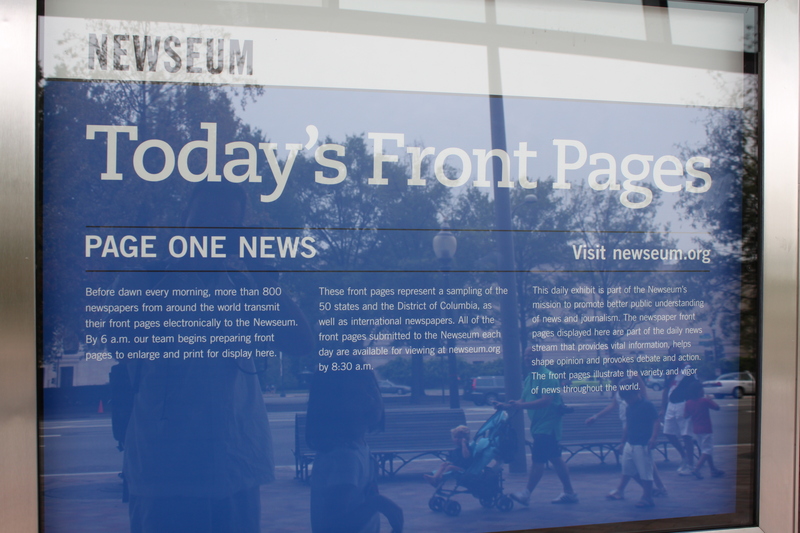 I loved The Newseum so much that when my family of six decided to take on Washington D.C. the following August for vacation, I championed to spend an entire day exploring The Newseum. Each member of my family chose a museum to visit or activity to do during our stay. My brother was fascinated by the National Air and Space Museum. My 6-year-old sister took us to an art museum. My mom chose a speciality cupcake shop. At the end of the week, my family decided it was no contest: The Newseum was the clear winner. “I could spend all day in there,” my stepdad said, after nearly 5 hours of perusing. People have a need to know. Journalists have a right to tell. Finding the facts can be difficult. Reporting the story can be dangerous. Freedom includes the right to be outrageous. Responsibility includes the right to be fair. News is history in the making. Journalists provide the first draft of history. Wow, I remember thinking. If that’s what journalism is…I’m in. Tagged with: journalism, news, Newseum, Washington D.C.